Ansco Great Year Camera 1956 Add. 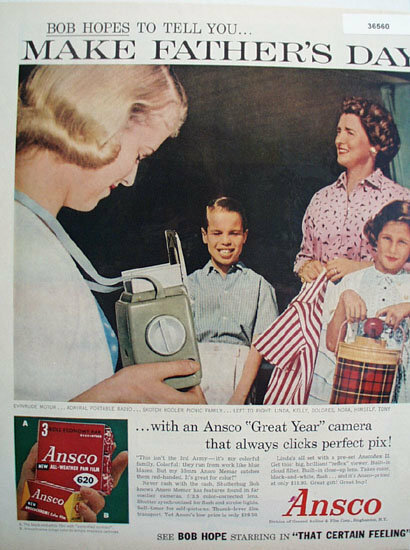 This color June 12, 1956 ad states Bob Hope tell you, Make Fathers Day with an Ansco Great Year Camera that always clicks perfect Pix. Picture shows woman with Ansco camera taking picture of woman, girl and boy who are standing posing for picture. Girl is holding Scotch Kooler Picnic family. Magazine tear sheet picture is taken through plastic and may show wrinkles or crookedness that is not in the ad. This Original magazine tear sheet measures 10 1/4 inches wide by 13 1/4 inches tall. Items Similar To "Ansco Great Year Camera 1956 Ad"
Ansco Great Year Camera Christmas Ad 1956 ad.